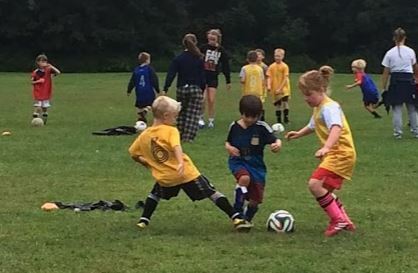 This program is run by experienced Northampton Soccer coaches with travel soccer training and credentials along with parent volunteer coaches. This fun program teaches beginning soccer skills for players in grades K, 1, and 2, with an emphasis on skill building and game dynamics. It runs twice a year, in spring and in fall. Practices are scheduled for Wednesday afternoons at 5:15 and Saturday mornings at 9:30 at the Florence Recreation Fields. Spring season runs Wednesday April 24th - Saturday June 8th. Typical sessions include instruction on dribbling, passing, and shooting, followed by drills where players keep moving and get many touches on the ball. We usually finish each session with small field 3v3 or 4v4 games in which coaches use teachable moments to further explain the game. This program is the ground floor of Northampton Soccer’s more competitive travel program.